Thanks to all those who came out to support Resort on Saturday morning! We have applied for the Pettman Depository to be listed as an Asset of Community Value. This would recognise Resort’s status as a place where people go for their cultural life and give us time to try and purchase the building. We have a vision for the Pettman building as a leading site of cultural production and community – we want to restore it to it’s former glory and offer more affordable workspace for artists and creative businesses; a cultural programme for our communities and visitors; and talks and workshops aimed at both the visitor economy and developing local people’s skills and knowledge. 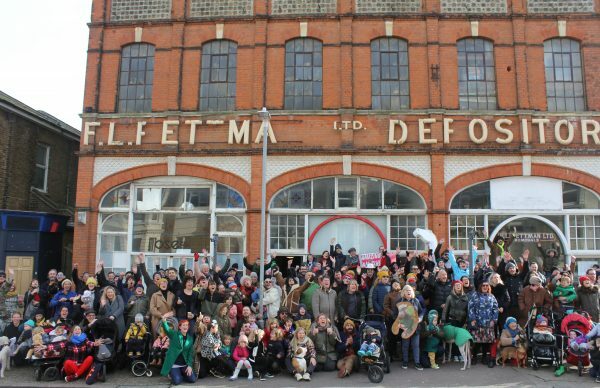 We are one of the largest centres of employment in Cliftonville, many of our former members’ small businesses have grown to take over other spaces around town (including empty shops), and we would like to continue our role as a flagship for economic regeneration.